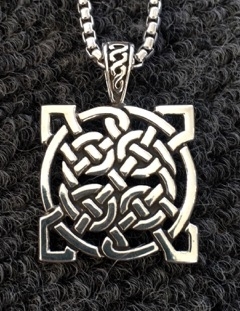 A new large version of this classic knot form describing the pathway through life. One goes metaphorically to the 4 corners of the earth to come back to the journey's origin and discover the soul! Around 1" square, pierced through, plus the deco bail, this is a bolder talisman for folks that like larger items on heavier chains.